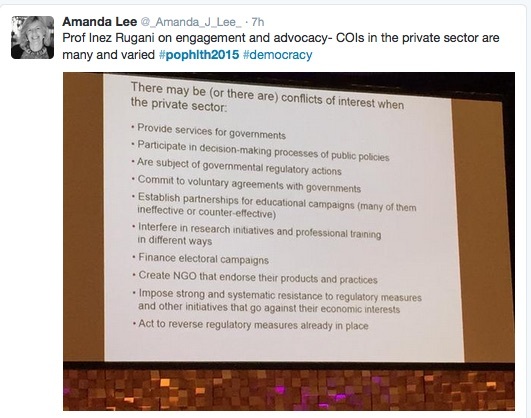 The final day of the Population Health Congress 2015 put the spotlight firmly on the topical issue of corporate strategies for manipulating health research and policy. 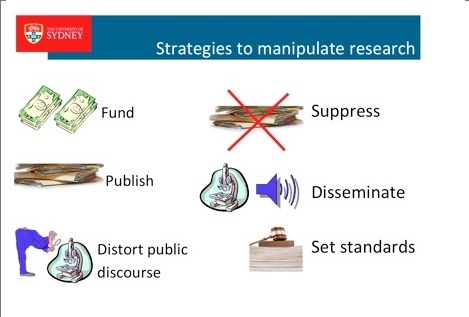 Professor Lisa Bero, an international authority on research integrity, told conference participants that research funded by a corporate body is “much more likely to have a finding that supports the funder’s product, whatever that might be”. “We’ve seen that across a variety of fields: tobacco, pharmaceuticals, nutrition, environmental risk assessment,” she told Croakey. Her presentation was timely, given controversy about a new organisation funded by Coca-Cola, the Global Energy Balance Network, that is seeking to recruit researchers to its work in inactivity and obesity. Bero’s presentation followed a vintage Bob Brown performance at the Congress dinner, where the former Greens Leader warned delegates not to allow corporations “to seize the throne of democracy” and challenged media boss Rupert Murdoch to a debate on climate change and the virtue of one person-one vote “any time, any place”. See more below. Bero is a pharmacologist and world leader in assessing bias in the design, conduct and dissemination of research on pharmaceuticals, tobacco and chemicals. Formerly of the University of California, San Francisco, she last year took up the position as Chair of Medicines Use and Health Outcomes at the Charles Perkins Centre at Sydney University. 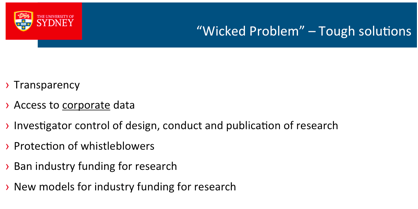 She told the conference’s ‘grand challenges, wicked problems’ plenary that pharmaceutical industry sponsored studies were about four times more likely to favour the drug being tested than others. An early study that looked at the impact of tobacco industry sponsorship on reviews of secondhand smoke found they were 90 times more likely to find second hand smoke not harmful. “What’s interesting is that it doesn’t happen because the methods of the studies are necessarily different: we can see a difference in the outcomes because the questions asked might be slightly different, there might be something going on behind the scenes about how the study is conducted and also the study might only get partially published – only the favourable part might get published. The impact, she said, was to “skew the public health literature” in certain directions, depending on the topic. Bero gave an early example of tobacco industry attempts to refute an influential Japanese study showed an association between passive smoking and lung cancer (see the summary pic below). She said other industries may not match the tobacco industry’s efforts, but evidence showed that they had learnt from its playbook. 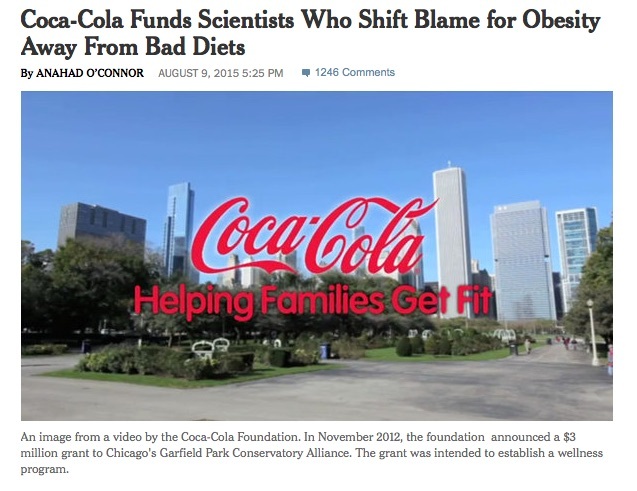 One of the big concerns about Coca-Cola’s funding for the Global Energy Balance Network had been the lack of disclosure, until Dr Yoni Freedhoff, an obesity expert at the University of Ottawa, wrote to inquire about its funding. The omission had now been “corrected”, the group said. But while disclosure is good and necessary, we can’t rely on it to prevent and address bias, Bero said. In fact, economics research has shown that making a disclosure actually “makes people more biased” in their advice. Bero is not sure why, but says theories are that either people feel they can be more free with their position when they have declared a conflict, or that people with those conflicts of interests are simply more biased. “So transparency is very important but it’s…not really sufficient to manage the conflict,” she said. Similarly, Bero has concerns about industry moves in the US to access public health research data so they can re-analyse studies, “according to their own epidemiological standards”. There are similar concerns here, with Cancer Council Victoria CEO Todd Harper telling the conference session on advocacy that he believed the real objective for the tobacco industry to seek access to data about smoking among young people “is to create a massive distraction for an organisation like ours”. Former Senator Bob Brown delivered a wide-ranging Congress dinner address to a packed historic venue, quoting Abraham Lincoln, Bertrand Russell, Isaac Newtown, Jimi Hendrix, Old King Cole, and throwing in a black cockatoo impersonation. Making the case for honest and fearless advocacy, he recalled the outcry in conservative circles in 2003 after he heckled then US president George W Bush – “in my own parliament, (for) using a democratic forum for democratic repartee instead of just living in subservience and silence,” he said. “Subservience to the current affairs moguls of the day is the biggest mistake we can make. We have a voice, we should use it,” he said. That subservience was also to be seen in politicians bowing to corporates in policy, he said. His fellow Senators had “collapsed” and dropped plans to ban plastic bags in supermarkets after Coles and Woolworths warned it would cost them $93 million a year. While 80 per cent of Australians wanted greater restrictions on advertising of junk food during prime time children’s viewing, “we still don’t have it because of the power of corporates over spineless politicians,” he said. Brown encouraged delegates to ring and congratulate any MP they ever see going out on a limb to do something for the public good without any personal gain. Brown, who retired three years ago, preached the need for optimism, but bemoaned that we seem always only to act when things have become really bad, whether on gun control or climate change. The former GP said he has been just putting the finishing touches to a children’s book called Thera, an anagram of Earth (and with ‘her’ in the middle). 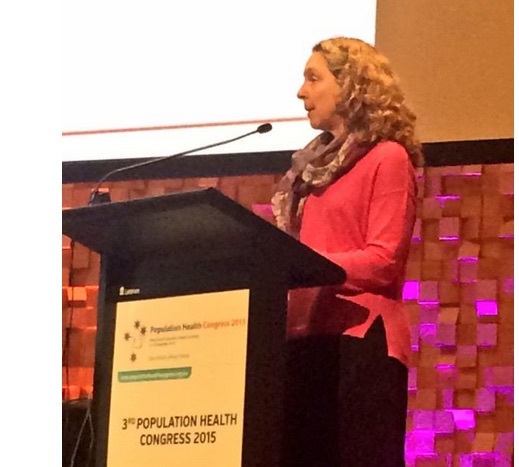 • Track Croakey’s coverage of #pophlth2015 here – and stay tuned for more conference reports on climate change and other public health matters. Quality in dentistry in Australia: Essential or volunteer extra?